Nantes was earlier the capital of Brittany. In the year 1962, Nantes was transferred to the Pays de la Loire region. Breton fortunes were an integral part of this city's history. The city is located by the sea and is one of France's major ports. Nantes-Atlantic acts as a metropolitan center for the west of France. This city was the birthplace of Jules Vernes. Nantes was also the cradle of surrealism. This city is also a popular destination for holidays in France. The lovely River Loire flows through this city and for the same reason, Nantes is often referred to as the great river city. Location: Nantes is located in Western France. Age Structure: In Nantes, people below 25 years of age comprise 35% of the population. Racial Makeup: French law forbids taking any data related to race or religious groups in a census. It is thus not possible to know the racial make up of any French city. Economy: Nantes holds the 3rd financial position in the economically powerful France. All the industries in the service sector are established in this city. Nantes is ranked at number five for information technology services. It holds the top rank as a boat-building center. The city is at the second position as a national aeronautical center. Here, there are numerous engineering companies. Also, the city is a leader in the French food industry. Climate: The summers in Nantes are warm. The temperature is around 18.5ºC. It's mild and rainy in winter. The temperature in winters is around 5º. Nantes is located 88 feet above sea level. The average temperature is highest in the month of July and August at about 68ºF. Nantes has an oceanic climate. Rainfall: Nantes receives an annual rainfall of 810.9 mm (31.9 inches). 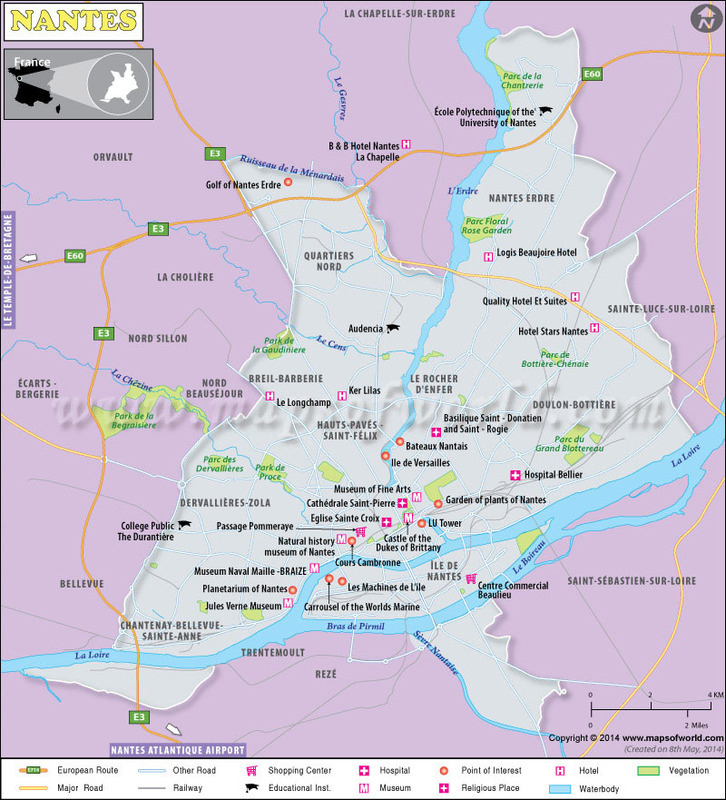 Government Type: This city functions as the administrative center for the Pays de Loire region. There are a total of 24 districts in communaute urbaine de Nantes Metropole.